YOUNGSVILLE, Tx (August 5, 2018)- In the opening game of the final home stand before playoffs, the Acadiana Cane Cutters fell to the Texas Marshals 4-2 despite a strong pitching start. 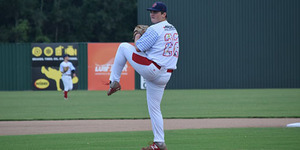 Joseph Battaglia III (BRCC) took the mound for the Cane Cutters for the first time since June 21st, having been used primarily as a reliever in his last six games. He pitched six innings, five of them scoreless, and struck out four batters. Sean Tweedy (University of Southern Mississippi) and Matthew Harrison (Meridian Community College) pitched a scoreless seventh and eighth before Jimmy Dobrash was sent in to close off the ninth for the Cane Cutters. Cole Secrest (Lamar University) put the Cutters on the board with a solo home run in the first inning. Preston Faulkner (SE Louisiana) was hit by a pitch to reach base and then scored on an RBI double off the bat of Nathan Gabryszwski (Lamar University). The Cutters will be back at Fabacher Field again tomorrow (8/6) against the Texas Marshals. Gates open at 6 PM and first pitch is at 7 PM for all home games. To get weekly updates on the team and other fun theme nights coming up, please visit our website and subscribe to our newsletter.